The following tutorials describe how to create pie charts in WINKS SDA and how to create Excel Pie and bar charts from WINKS. The files needed for these examples are in your WINKS file directory. 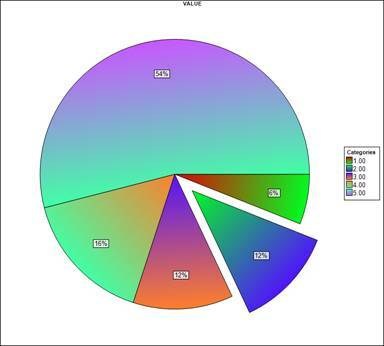 Create a pie chart from frequencies – WINKS counts items in categories and creates a bar chart. Open the data set named EXAMPLE.SDA. Select Graphs – Pie Charts – Pie Chart (from frequencies) and select SOCIO as the Data Field. The following pie chart is displayed. To edit the chart, right click anywhere outside the box, or choose File/Options. See the Bar Chart tutorials for information on how to select options. 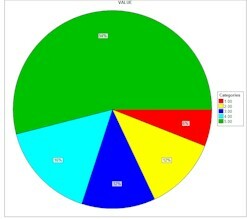 An option unique to Pie Charts is to separate a pie slice. Do this by selecting Options, and click on the Pie Chart tab. 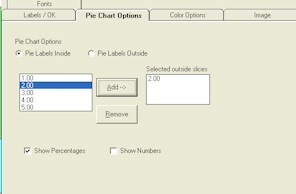 Select a pie slice index from the left and click on Add to add to the “select outside pie slices” box. When you choose Label/OK and Ok the slice will be separated from the other. In this example, slice 2 is selected. On the Color option, check the Graduated colors option. When you exit the dialog box, the following Pie Chart is displayed. Selct VAR1 as the data field, and Label as the label field. Click on Label/OK and Ok and the chart is displayed. To create a pie chart or pie chart by entering data, select Graph – Pie & Bar Charts – enter data from keyboard. Follow the description in the Bar chart tutorial.